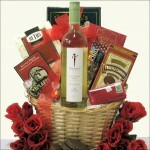 Are you looking for something a little different, then send them the 'Skinny Girl' wine and sweets gift basket? At only 100 calories per serving you can choose from White, Red or Rose California Wine. Also included in the basket are Cookies, Candy, Chocolate and a Kind Cranberry Almond & Antioxidants Bar so that they won't feel so guilty when they eat the entire basket in one sitting. A unique gift for many different occasions. ...in an Oval Gift Willow Basket.